Sussex Police has released CCTV images after a ‘profoundly disabled man’ was mocked and abused on a bus in Brighton. Police said the incident took place on the number 5a double-decker bus in Ditchling Road, Brighton, at 11.25am on Tuesday, July 24. 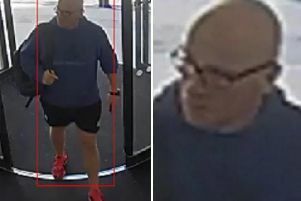 The victim, 52, was in a wheelchair on the lower deck and accompanied by his carer when the suspect launched a venomous verbal attack on him, police said. Officers said the attack caused the victim to ‘cower in fright’. The man police wish to speak to is described as white, in his 40s or 50s and with receding grey hair. He was wearing a light-coloured polo shirt. Other passengers or anyone else who may have seen or heard the incident, or who recognises the suspect, are asked to contact police online or by phoning 101, quoting serial 799 of 24/07.